Amendment of the Federal Constitution is provided for in Article 159. Clause (1) declares that “Subject to the following provisions of this Article and to Article 161E the provisions of this Constitution may be amended by federal law. Some parts may be amended by a simple majority in both Houses of Parliament such as that required for the passing of any ordinary law: Article 159(4). Note that first, the power to amend the Constitution is vested in the Parliament. Secondly, nowhere does it say that certain articles form the basic structure of the Constitution and cannot be amended. Thirdly, nowhere does it say that the court may decide on a case to case basis which articles form part of the basic structure of the Constitution or not and, therefore, may or may not be amended. It was understood, therefore, that in accordance with the doctrine of separation of powers, it is the Parliament that has the power to amend any part of the Constitution provided it follows the right procedure as provided by the Constitution. In 1973, the Indian Supreme Court decided the case of Kesavananda Bharati v State of Kerala, AIR 1973 SC 1461. The court held that Article 368 (on the amendment of the Indian Constitution) does not enable Parliament to alter the basic structure or framework of the Constitution. The effect of that judgment is that certain provisions of the Indian Constitution form the basic structure of the Constitution. The court will decide which provisions of the Constitution form the basic structure of the Constitution on a case by case basis. The court will then use basic structure principle as the basis of its power to review, and to strike down, amendments to the Constitution of India enacted by the Indian Parliament which conflict with or seek to alter this basic structure of the Constitution. As such, the amending power of Parliament is limited and does not extend to damaging any of the essential features of the Constitution, as may be determined by the court. With that judgment, the judges gave themselves and their colleagues the power to strike down any amendment by Parliament of any provision of the Constitution which the judges say form the basic structure of the Constitution; and to strike down any amendment by Parliament that seeks to alter this basic structure of the Constitution as determined by them. That case was decided by a slim majority of 7 to 6. It is said that when the case was decided, the perception by the majority bench that elected representatives could not be trusted to act responsibly was unprecedented. It was also said that the subsequent passage of the 39th Amendment to suppress Indira Gandhi’s prosecution and the imposition of the state of emergency by Indira Gandhi in 1975, proved that in fact this apprehension was well-founded. Those were the circumstances under which the judgment was delivered. Anyway, those circumstances were peculiar to India then. Following that, lawyers in Malaysia, particularly the former Presidents of the Bar Council like Mr GTS Sidhu, YM Raja Abdul Aziz Addruse and Mr Param Cumaraswamy tried to persuade the Malaysian Federal Court to follow the said judgment and adopt the principle. It is the province of the courts to expound the law and “the law must be taken to be as laid down by the courts, however much their decisions may be criticised by writers of such great distinction”– per Roskill L.J. in Henry v Geopresco International Ltd  2 All ER 702 718. Those who find fault with the wisdom or expediency of the impugned Act, and with vexatious interference of fundamental rights, normally must address themselves to the legislature, and not the courts; they have their remedy at the ballot box. “Whatever may be said of other Constitutions, they are ultimately of little assistance to us because our Constitution now stands in its own right and it is in the end the wording of our Constitution itself that is to be interpreted and applied, and this wording “can never be overridden by the extraneous principles of other Constitutions” — see Adegbenro v Akintola & Anor  3 All ER 544 551. Each country frames its constitution according to its genius and for the good of its own society. We look at other Constitutions to learn from their experiences, and from a desire to see how their progress and well-being is ensured by their fundamental law. (For the sake of brevity, I have omitted a large portion of the judgment). In 1980, the Federal Court consisting of Suffian LP, Wan Suleiman and Syed Othman FJJ heard the case of Phang Chin Hock v. Public Prosecutor  1 MLJ 70. The Counsel was Mr GTS Sidhu. Parliament have power to make constitutional amendments that are inconsistent with the Constitution. It should be noted that, in his judgment, Suffian LP considered the Indian cases on the basic structure issue including Kesavananda Bharati v State of Kerala  SCR 1; AIR 1973 SC 1461 Supp; Shankari Prasad Singh Deo and Others v The Union of India and Others AIR 1951 SC 458; Sajjan Singh v State of Rajasthan AIR 1965 SC 845; IC Golak Nath & Others v State of Punjab (1967) 2 SCR 762; AIR 1967 SC 1643.
which I have reproduced above. 8) If the framers of the Singapore Constitution had intended limitations on the power of amendment, they would have expressly provided for such limitations but art 5 has no such limitation. 9) If the courts have the power to impose limitations on the legislature’s power of constitutional amendments, they would be usurping Parliament’s legislative function contrary to art 58 of the Constitution. 10) The Kesavananda AIR 1973 SC 1461 doctrine (that there were basic features of the Constitution that Parliament could not amend) is not applicable to the local Constitution. Considering the differences in the making of the Indian and the local Constitution, it cannot be said that our Parliament’s power to amend our Constitution is limited in the same way as the Indian Parliament’s power to amend their Constitution. In 2007, 30 years after Loh Kooi Choon was delivered, the Federal Court consisting of Ahmad Fairuz CJ, Abdul Hamid Mohamad PCA, Alauddin CJ (Malaya), Richard Malanjum CJ (Sabah and Sarawak) and Zaki Azmi FCJ heard Public Prosecutor v Kok Wah Kuan  1 MLJ 1. The issue was whether section 97(2) of the Child Act 2001 (Act 611) was constitutional. The Court of Appeal held that it was unconstitutional as it contravened the doctrine of separation of powers embodied in the Federal Constitution by consigning to the Executive judicial power vested in the courts. Loh Kooi Choon stood as the law of the country for 33 years. One would have thought that the issue regarding the basic structure of the constitution was settled. Towards the end of his career, Gopal Sri Ram JCA was promoted to the Federal Court. 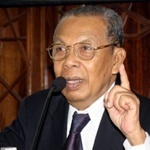 He was a member of the panel that decided Sivarasa Rasiah v Badan Peguam Malaysia & Anor. 2 MLJ 333. Even though he was the most junior member of the panel, he delivered the judgment of the Court. The issue was whether section 46A(1) of the Legal Profession Act 1976 was unconstitutional. The court, through the judgment of Gopal Sri Ram FCJ held that it was constitutional. When a judge or the court “reads into” or adds the word “reasonable” into Article 10(2)(c), is the judge or the court not effectively amending the Constitution? Is the judge or the court not encroaching into the jurisdiction on the Legislature (i.e. the Parliament)? Can one judge of the High Court or a minimum two judges of the Court of Appeal or of the Federal Court replace the function of two thirds majority in both Houses of Parliament? Is the basic structure principle laid down in Kasavananda Bharati the ratio or mere obiter of Sivarasa Rasiah? Looking at the grounds, I do not see the need to introduce the basic structure principle at all. After all, the appellant was challenging the law as against the Constitution. There was no attempt to amend the Constitution which the court might say form the basic structure of the Constitution. There was no attempt to amend any part of the Constitution which may affect what the court considers as forming the basic structure of the Constitution. If the section violates one of the provisions of the Constitution, the section is unconstitutional, whether or not the said provision forms the basic structure of the Constitution. It follows then that the introduction of the principle is a mere obiter dictum. That being the case, the introductory part of the judgment where the learned judge made the three preliminary observations ending with the reliance on Kesavananda Bharati, is no more than an obiter. In any event, since Gopal Sri Ram FCJ held that section 46A(1) of the Legal Profession Act 1976 was valid, where was the need to introduce the basic structure principle in this country? Then Gopal Sri Ram FCJ went on to state the principle of basic structure and cited the case of Kesavananda Bharati as authority. In so doing, the learned judge buried the judgment of the Federal Court in Loh Kooi Choon which had been our law for three decades in favour of a judgment of the Indian Supreme Court. (In fact, he buried two judgments of the Federal Court, the other being Phang Chin Hock, which he seemed to have missed). I submit that every statement made by Raja Azlan Shah FCJ in Loh Kooi Choon is correct, in the Malaysian context. He need not even cite the English authority, the Vacher case. The statements can stand on their own. Similarly, the words of Lord Macnaghten in Vacher are equally valid in the Malaysian context so long as the law in question does not offend the Constitution. Of course the “Constitution” does not include what judges would themselves add under the basic structure principle! It would be an insult to the intelligence of Raja Azlan Shah FJ to think that he was not aware of the differences between the English and the Malaysian positions. Gopal Sri Ram FCJ then immediately cited a three-sentence passage from the judgment of Suffian LP giving the impression that what Raja Azlan Shah FCJ said was wrong, in the Malaysian context. That passage merely reaffirms that, in Malaysia, Parliament cannot make law, meaning ordinary law, which is contrary to the provision of the Constitution. That is what Article 4(1) says. Even if the learned judge was right in rejecting Raja Azlan Shah’s judgment in Loh Kooi Choon, there is another judgment of the case by Wan Suleiman FJ. Wan Suleiman FJ did not rely on the Vacher case, yet he came to the same conclusion as Raja Azlan Shah. Gopal Sri Ram FCJ missed it completely. The learned judge cited 36 cases in his judgment, including judgments of the courts in England, India, Canada and the United States, but somehow he missed Phang Chin Hock and Teo Soh Lung. To me, for him to miss Phang Chin Hock has very serious consequences on his argument in rejecting Loh Kooi Choon. This is because, according to him, reliance on the Vacher case by Raja Azlan Shah FJ in Loh Kooi Choon was misplaced which gave him reason to reject it. Suffian LP did not rely on the Vacher case but arrived at the same conclusion as Raja Azlan Shah FJ did in Loh Kooi Choon. On what ground would he reject Phang Chin Hock? The last point I wish to note on Sivarasa Rasiah is that it did not even mention the amendment to Article 121. It merely “imported” the basic structure principle without using it as there was no necessity to do so. That is why I am inclined to the view that it is mere obiter. The court will also strike down any amendment to any part of the Constitution which conflicts with what the judges say forms part of the basic structure of the Constitution. Is that not rewriting or amending the Constitution? Is that not encroaching into the jurisdiction of the legislature or judicial interference with legislative functions? Where do the judges obtain the power to do that from? The Indian Supreme Court? It is interesting to note that even after Sivarasa Rasiah was decided, that passage from Raja Azlan Shah”s judgment continued to be cited with approval in at least two more judgments of the Federal Court. The cases are Dato’ Seri Ir. Haji Mohammad Nizar Jamaluddin v Dato” Seri Dr Zambry Abdul Kader, Attorney Ganeral, (Intervener) (2010) 2 CLJ 925 and Said Mir Birhami v Pengarah Penjara Sungai Buloh, Selangor (2013) 5 CLJ 447. In both cases, the Chief Judge (Malaya) was also a member of the panel. We now come to Semenyih Jaya Sdn Bhd v Pentadbir Tanah Hulu Langat Rayuan Sivil No. 01(f)-47-11/2013 (B) seems to do. The judgment was handed down on 20 April 2017, 60 years after independence. I am not writing a review of the judgment. I am merely touching on the issue under discussion. The 5-member panel belongs to the younger generation who were a few years old on Merdeka Day. I do not know whether they were aware of, or appreciate the history of, the attempt to introduce the basic structure principle. Or, were they carried away by the idea of being seen as the judges “responsible for the development” of the law of this country, together with Gopal Sri Ram FCJ? The Chief Judge (Malaya), the presiding Judge, was a member of the panel which decided the case of Sivarasa Rasiah. As he had remained silent in that case, one does not expect him to say anything to the contrary in this case. So, he decided to remain silent too. (But, on two occasions, after Sivarasa Rasiah was decided, he agreed with Raja Azlan Shah’s judgment in Loh Kooi Choon.) The other three Judges too chose remain silent. Reading somebody’s draft judgment is different from writing it yourself. The chances are that you do not even read the judgments referred in the draft, what more analyse each and every one of them when there are so many of them. You may end up reading only the cut and paste portions of those judgments which seem to fit with the draft judgment. That judgment, written by Zainun Ali FCJ, relied fully on and adopted the judgment of Gopal Sri Ram FCJ in Sivarasa Rasiah without any question. It also missed Phang Chin Hock and Teo Soh Lung. Instead of quoting passages from the judgment and expressing my views on them which will make this article unnecessarily long, I will merely state my position for the readers to consider. We have a written Constitution. So, if we want to know the powers of the executive, the legislature and the judiciary respectively, we should look for them in the Constitution. Thus, legislative power, i.e. power to make law and to amend the Constitution is given to Parliament. How to exercise the power to amend the Constitution is provided by Article 159. So long as the provision remains, it must be complied with if Parliament wants to amend the Constitution. If any restriction to the amendment of the Constitution should be added, it is Parliament that should do it by amending the Constitution to provide for it, because it is a legislative act. Even then, it cannot be permanent. Parliament may amend it again, later. It may be said that that will make Parliament supreme while Article 4 says that the Constitution is supreme. There is a fallacy in that argument. What does Art 4(1) say? It says: “(1) This Constitution is the supreme law of the Federation…” That is a declaration and nothing else. Then the substantive part follows: “…and any law passed after Merdeka Day which is inconsistent with this Constitution shall, to the extent of the inconsistency, be void.” That is what supremacy of the Constitution means. Article 159 gives power to Parliament to amend the Constitution but exercisable in certain ways. If Parliament, in strict compliance with the provisions of the Constitution, amends the Constitution, the Constitution is amended. There you can say that Parliament is supreme because it can amend the constitution. But remember that if Parliament does not comply with the specific requirements in seeking to amend the Constitution, that amendment is void, because the Constitution is supreme. Who decides whether Parliament complies with the requirement of the Constitution or not? Answer: the court, because judicial power is given to the court to declare an amendment void if it does not comply with the requirements of the Constitution. There you can say that the court is supreme. But, at the end of the day, who decides whether or not to move a bill in Parliament to amend the Constitution? Answer: the Executive (which, in reality, could be the Prime Minister who could influence the Cabinet to agree to his proposal and then influence Parliament to pass he law). At that point you may say the Executive (or the Prime Minister) is supreme. So, if you want to talk about supremacy, every branch could be said to be “supreme”. Every branch has a role to play according to what is given to it. That is “separation of powers”. Just because a few judges think that the two thirds majority in each House of Parliament cannot act responsibly or the power of the Judiciary is threatened or eroded, can the judges give themselves the power to amend the Constitution to provide limitations on Parliament to amend the Constitution, permanently? On the other hand, what if the two thirds majority in each house of Parliament think that some judges cannot judge impartially in a case involving a member of Parliament, can members of Parliament pass a resolution to remove the case to Parliament? The answer has to be “No” to both the questions, not “Yes” to the first and “No” to the second. We have accepted parliamentary democracy as our form of government. We should allow it to function unless we prefer an alternative, say, dictatorship of the judges! Parliamentary democracy is not perfect. Are judges perfect? At least, members of Parliament are answerable to the voters. Who are judges answerable to? However, the court (in Semenyih Jaya Sdn Bhd) did not strike down the amendment to Article 121(1) (by the Constitution (Amendment) Act 1988 [Act A704] as being unconstitutional because it sought to amend a provision which in the opinion of the court, forms the basic structure of the Constitution, following the Indian Supreme Court judgment in Kesavananda Bharati and our own Federal Court judgment in Sivarasa Rasiah. As a result we do not know the status of Article 121(1) now. Is the 1988 amendment void? Is it valid but the court, following the minority view of Richard Malanjum (Chief Judge Sabah and Sarawak) was “unable to accede to the proposition that with the amendment of art 121(1) of the Federal Constitution (the amendment) the courts in Malaysia can only function in accordance with what have been assigned to them by federal laws…” If that is so, what then is the effect of the amendment? Valid but of no effect? To cut the discussion short, my questions and comments with regard to judgment of the court written by Gopal Sri Ram FCJ in Sivarasa Rasiah are applicable to the judgment of the court written by Zainun Ali FCJ in Semenyih Jaya Sdn Bhd. Now five other judges had given Sivarasa Rasiah a seal of approval. The basic structure principle is now the law of this country. Why do I object to the introduction of the basic structure principle? I am objecting to it on ground of principle and nothing else. It does not matter to me whether, on this issue, I am on the side of politicians and not judges. We cherish the doctrines of independence of the judiciary, separation of powers, rule of law, Parliamentary democracy and supremacy of the Constitution. With these two judgments, those doctrines are distorted by the judges to give themselves the power to encroach into the jurisdiction of the Legislature and rewrite or amend the Constitution or the law. This, with the ever expanding scope of judicial review to which Gopal Sri Ram JCA (as he then was) was also the proud author, will give judges additional power to “review” the functions of the Legislature and the Executive. I am not against judicial review. But I am against unchecked expansion of the grounds for intervention by judges. See my speech “Should the Industrial Court not be allowed to be what it was intended to be?”, which is available on my website. What recourse do they have? The answer is to revert to the Constitution. The power to amend the Constitution is vested in Parliament. In the name of parliamentary democracy and separation of powers, all members of Parliament, whether they are from the government or the opposition, should come together and move a bill to amend the Constitution to the effect that Parliament may amend any part of the Constitution provided the procedure laid down by the Constitution is followed. The original position should be restored.